I turned 18 years of age in 1943. I got into the Navy and went through boot camp in San Diego. I then went to gunnery school and then was transferred to Treasure Island in San Francisco. There I went to advanced electronic and hydraulic school. When the USS Warrick AKA 89 was launched, I went aboard as a 3rd Class Gunners Mate. After some time in the South Pacific I made 2nd Class Gunners Mate. On Jan. 11, 1945, we made the invasion of the Philippines under the command of General Douglas MacArthur and retook them from the Japanese. Iwo Jima was a small (two miles by four miles) volcanic island that lay halfway between Guam and Japan. It had an airfield on it and was occupied by the Japanese. Our B29 bombers flew from Guam to Japan but our fighter planes could not fly that far because of fuel capacity. So we needed the airfield. One month after the invasion of the Philippines on February 19, 1945, we made the invasion of Iwo Jima. The Japanese lived underground. After heavy fighting and fierce hand to hand combat we defeated the Japanese and secured the island March 7, 1945 with the loss of 7,000 Americans and 22,000 Japanese. This was one of the worst battles of WWII. After the war ended and Japanese surrendered in September 1945 we went to Japan with the occupation forces. 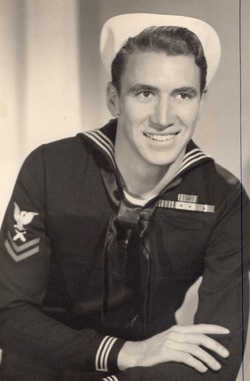 I was discharged from the Navy in March of 1946. I got married to a girl who I had been going with before I went into the Navy. We looked at the models of the homes that were to be built in Lakewood and picked the model we wanted by the pin on a map. We waited for nearly a year for the house to be built. We still live in the same house. We love Lakewood.